Nourishment is essential in this Ramadan season, send a Classical basket with seasonal fruits to your dear ones on the auspicious occasion of Ramadan and Eid. 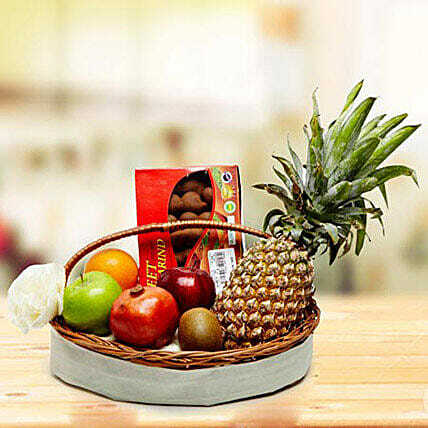 The basket contains: Tamarind Sweet Imported Pack 500gm, 1 Piece Pineapple 1kg, 1 Piece Apple Washington, 1 Piece Apple Green, 1 Piece Pomegranate Red, Tangerine 1 Pieces 1 Piece Kiwi in a decorated basket. Please Note: If a particular fruit is not available, then we will replace it with available seasonal fruit of same or higher value. The best way to lengthen the shelf life of fruits is by storing them in the refrigerator. Please wash them thoroughly before consumption.